Lee Ellard is national sales manager, Stamtec, Inc., a manufacturer of stamping presses and a distributor of feed lines and quick-die-change apparatus: 931/393-5050, www.stamtec.com. A good first step to quickening the pace of die changes: create an efficient pressroom layout, and store dies close and convenient to the press area, with easy access to the dies by the transport vehicle. Photo courtesy of Green Valley Mfg. associated with hardware including hydraulic clamps, die rollers, bolster extensions and die carts. 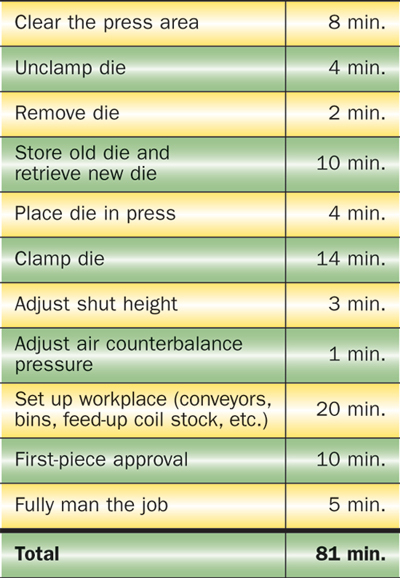 However, also required to minimize downtime from the last good hit on one die to the first good hit on the next die is a well-formulated, efficient die-change process. The beautiful thing about developing a successful quick-changeover process is that although it does require some intense thought and effort, most of the plan can be accomplished with minimal cost. Most shops can trim changeover time to less than 20 to 30 min. with little cost. Then, to get die changes done in as little as 5 to 20 min., capital investment may be required. • Clear the press area. • Unclamp, remove and store the die. • Retrieve the new die, and locate it and clamp it in the press. • Achieve first part approval. • Analyze the current job-change process—Videotape a few job changes. Develop a list of specific improvement goals—The above times may seem extreme, and hopefully your change-overs occur more quickly than 81 min., but most stampers have room for improvement. Assign responsibility—Make someone, such as the press operator, setup person or foreman, responsible for implementing each improvement idea. Train the other personnel—During the planning phase, ensure that the core process-improvement team receives input from others involved in change-overs, to engage them in the process. After planning, document and post the proper procedures and conduct training sessions for all involved. Track the improvements—Keep written, posted records of before and after results. An efficient pressroom layout is a must. While rearranging the shop may not be possible, at least make it clean and uncluttered, to allow employees to move about quickly and safely during job changes. Immediately following the last hit on the current die, move parts and scrap bins, unloaders, and other appratus out of the , so as to not impede the rest of the process. Bolster extensions such as the pivoting type shown here allow dies to be rolled on and off of the press bed for easy retrieval by die-transport vehicles. Locate staging areas for tooling, coils and the like close to the press and have items prestaged in those areas well in advance of the last hit of the current die or coil. And, when not in a press or a staging area, store dies and coils close and convenient to the press area, with easy access to the dies by the transport vehicle. Keep the transport vehicle quickly available. 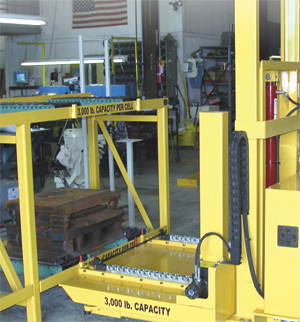 Since the vehicle is often a forklift, which tends to get borrowed for other tasks throughout the plant, consider dedicating a forklift just for die changes. Or, buy a dedicated die cart. Strive to have all dies designed with the same clamping height; better yet, mount all of the dies on subplates standardized for clamping height as well as left-to-right and front-to-back dimensions. Standardization allows use of the same size clamping fixture for all dies. And, with standardized subplates, fixed die-locating pins can be used in the press bed for quick, accurate die locating. Placing of clamps can be easier or possibly even automatic. • Add external blocks (such as ears) to existing dies to obtain a standard clamping height. • Machine die-clamping surfaces to a standard clamping height. • Mount dies on subplates of a standard thickness. • Mount dies on subplates of a standard thickness and standard dimensions, or perhaps develop a few standard sizes covering your complete range of die sizes. For example, establish a small subplate (60 x 30 in. perhaps), medium (84 x 48 in. ), and large (144 x 60). • Use locating pins or die guides on the press bolster to allow consistently quick and accurate die setting. • Standardize clamp pieces and store them with the dies or on the press. • Standardize shut heights or, as an alternative, install automatic shut-height adjustment through your press control. Another related time saver is use of automatic air counterbalance adjustment. Once a stamper has implemented all or most of the above processes, congratulations! Now we can talk about what should be one of the last steps to improve job-changeover efficiency—the hardware. Control box—A simple, compact, enclosed control box mounts where it’s most convenient, and controls hydraulic die lifters and clamps with just a key switch and a few illuminated buttons. Hydraulic power units—The proper power unit supplies not only the correct pressure, but also the number of circuits for the required or desired safety level for equipment, tools and people. Die lifters—Individual or array type, spring, air or hydraulically actuated die lifters lift and assist movement of dies on the press bed. Bolster extensions—Dies can be rolled from the press bed onto removable, pivoting, or swing-down bolster extensions for easy retrieval by die-transport vehicles. 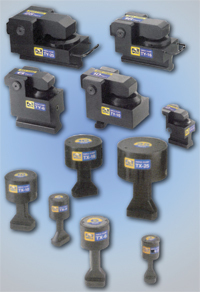 Metalformers have a wide variety of hydraulic clamps from which to choose, including ledge clamps (top), which can be placed manually in T-slots or bolted to the bolster or slide, and clamp directly on a flat clamping surface; and rod clamps (bottom), which mount in T-slots on the bolster or slide and U-slot cutouts on the clamping surface. directly on a flat clamping surface. • Rod clamps must mount in T-slots on the bolster or slide and U-slot cutouts on the clamping surface. • Roto-Escam clamps hide beneath the press bed or inside the slide. The clamping rods rotate 90 deg. and retract below the bolster and slide plate, completely escaping the die area and allowing for clear access when loading and unloading a die. They can clamp in a T-slot or in a special machined hole. • Swing clamps release the die by tilting 30 deg. to one side, and must have U-slot cutouts in the clamping surface. • Traveling clamps use a driven chain mechanism or an air cylinder to automatically travel down a T-slot to reach the clamping surface.